I've come across double third cousins, who are third cousins through two different routes as the same two families had two separate marriages between them that leads to this situation. That third cousins would share an average of 79 cM and vary between 0–198 cM. In this case, I found 194.3 cM which seems to support the double third cousins situation, but wonder if we can be more specific as to what to expect for average and range in such a situation. On Wikitree.com 3rd cousins or closer is the limit to qualify for direct autosomal DNA comfirmation without requiring DNA triangulation. Would double 3rd cousins move one into needing triangulation or away from it to confirm the connection? I would think it would move the relationship closer and thus be considered closer than 3rd cousins, but with DNA it might be more complicated than that. Double third cousins would indeed have double the expected cM of single third cousins. 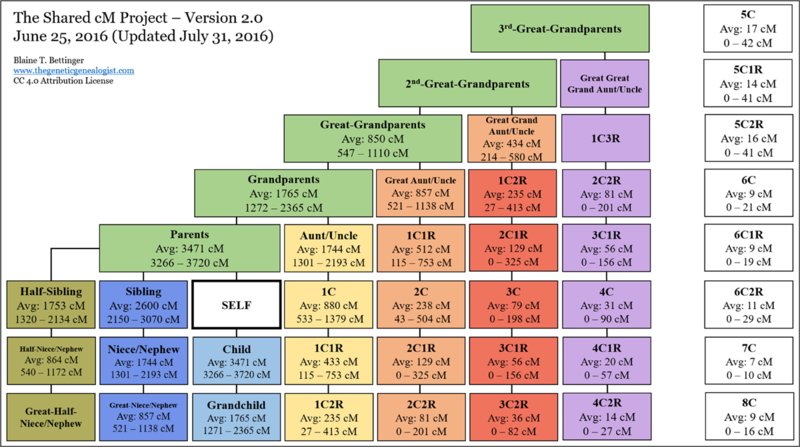 The 3C in your table shows an average of 79 cM and a range of 0 to 298 cM, so double third cousins should average 178 cM with a range that could be from 0 to 596 cM. So double third cousins would move one away from needing triangulation to confirm the connection. Yes it does make the relationship closer than single 3rd cousins. Not the answer you're looking for? Browse other questions tagged dna autosomal-dna triangulation or ask your own question. What do you call folks that are third cousins two different ways?